Yes, that's what Ken and I are now, parents of an L.S.U. student. 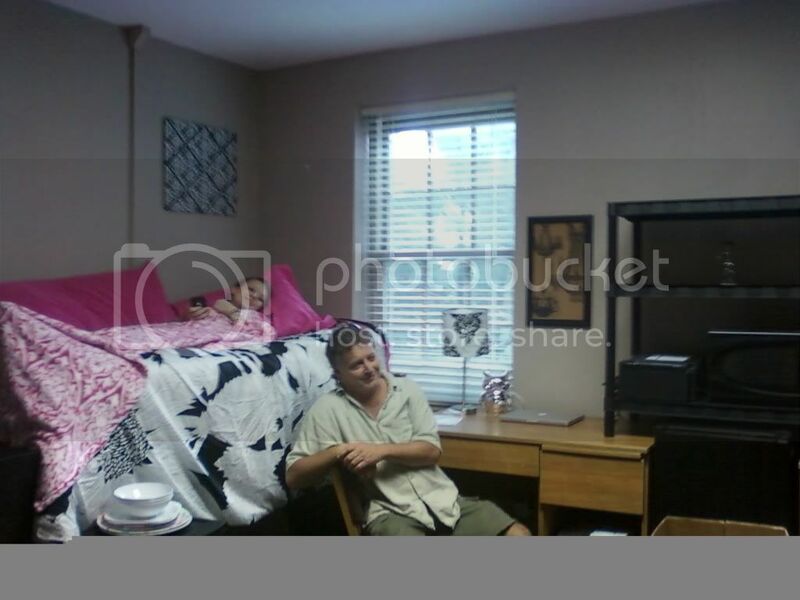 Yesterday (on Ken's 44th birthday), Ken and I moved our daughter into her dorm at Louisiana State University in Baton Rouge, LA, which is about 1 1/2 hours from our home. It was such a surreal time, as it seems like just yesterday she was going to her first day of kindergarten. The night before, the three of us went to eat at our favorite Italian restaurant, Sal & Judy's. My parents treated, and we celebrated Erica's new chapter in life as well as Ken's birthday. 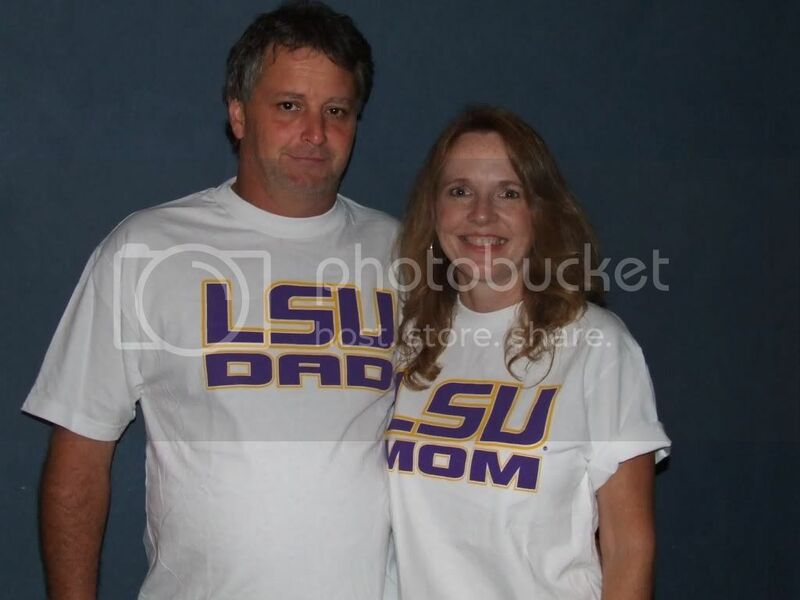 When we got home from dinner, we put on our LSU Mom & Dad shirts and took the above picture. We were forbidden to wear these shirts on move-in day by our daughter, as she did not want to be so humiliated by us. We then helped Erica pack up her car and made another stack in our house to put in Ken's truck the next morning. Erica's best friend is going to be her dorm mate, so Erica went to her house to help her pack and then spend the night. Therefore, after Erica's car was packed, she gave Ken his birthday present. It was the perfect gift, an i-Pod with over 700 songs on it from our stack of CD's. This will be perfect for the sailboat! We're behind the times and have never owned such a device, so Erica will have to give us lessons later. Afterwards, Erica gave us each a hug and took off in her car that night. We watched her drive off, shut the front door, and sat on the sofa. All of a sudden, it hit us both like a ton of bricks that our daughter was no longer living full-time at home. We just sat there, staring at each other as the tears rolled down our face. Wow! We never expected to get so emotional that night, but there we were ... crying and already wanting to give our daughter another hug. We weren't crying because she was gone as much as we were crying for wanting to keep her safe and no longer being able to "protect" her. We're so proud of our daughter, as she is smart, motivated, and so independent. 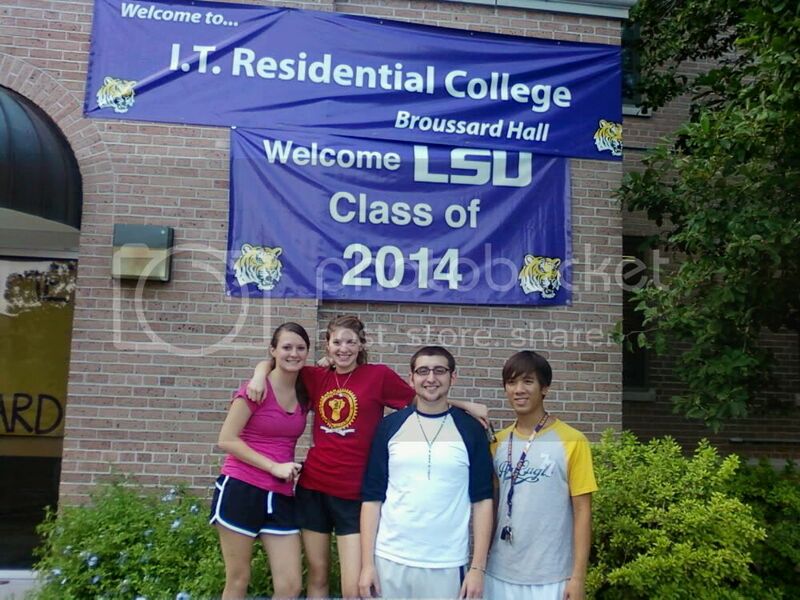 We're sure she'll be fine and excel at LSU, but no matter how old she gets, she'll always be our little girl. It was a long day, and Ken and I were mentally exhausted after we got back home from our 1.5 hour drive. We blew off the plans we had to go to dinner for Ken's birthday, and went home and to bed. I spoke with Erica this morning, and her boyfriend was coming to visit her this weekend and buy some last minute things for her room. She said she slept well, and seems really excited about college. Classes start Monday, but she has things to do there this weekend, so it looks like we won't be seeing her until next weekend. When we do, we'll be spending time with her and her boyfriend in Destin, FL. Ken and I are really looking forward to it. I'm really glad when my youngest started college she lived at home so the whole letting go thing was very gradual! But I do remember moving my older two out and it was a very odd feeling. At least she's only an hour and a half away! We've been to Destin and I love the white beaches. Have fun! Congrats on your baby going to LSU!! It was tough for us to let go, but the empty nest, er boat, is really nice. They really do grow up fast. Best of luck to you and your daughter. Laura - yes, we are so glad she's only 1 1/2 hrs away. She just finished her first weekend there and having a blast. My mom owns a home in Destin, so have been there many times, but not yet this year. It is beautiful - can't wait!